Like many good stories, this one begins with a puzzling question: how was it that a majority of Reformed evangelical theologians changed their minds on an aspect of the doctrine of the Trinity, almost overnight? As Giles says, “On 1 June 2016 it seemed that the complementarian hierarchical doctrine of the Trinity had won the day” (8). The few dissenters, of whom Giles was the most vocal, were dismissed as “evangelical feminists” and accused of framing the co-equality of the three persons of the Trinity and thereby providing a foundation for their egalitarian views on gender. But everything changed two days later when “a deep and sharp split among those who call themselves complementarians suddenly and unexpectedly appeared” (35). The split was not about the subordination of women to men, but about their understanding of the Trinity. Some complementarians (including, ironically, two women theologians, Rachel Miller and Aimee Byrd, who both wrote endorsements for Giles’s book) had been raising concerns about the doctrine of the eternal (functional) subordination of the Son to the Father. But the real crisis arose when Liam Goligher, a self-described “biblical complementarian,” denounced the teaching of the most well-known proponents of this view, Bruce Ware and Wayne Grudem, accusing them of “reinventing the doctrine of God” and departing from “biblical Christianity as expressed in our creeds and confessions.” What complementarians had not been able to hear from Giles for years was at last being heard, and “the evangelical blogosphere exploded” (37). 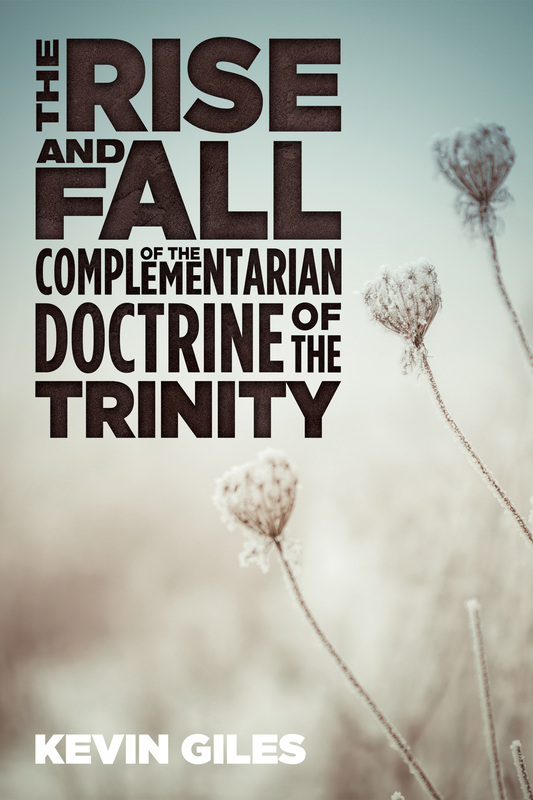 If the fall of the complementarian doctrine of the Trinity took place in 2016, when was its rise? Giles dates its genesis to George Knight III’s 1977 book, New Testament Teaching on the Role Relationship of Men and Women (Baker). In an effort to justify the exclusion of women from positions of leadership and teaching in the church, based in an understanding of male headship that meant wives should be subordinate to their husbands, at a time when appeals to male superiority and female inferiority were no longer culturally acceptable, Knight introduced the novel idea of men and women having different “roles” in spite of their equality. By “role” he meant simply that men’s role is to lead and women’s is to submit. But this raised the question, how can the permanent subordination of women be reconciled with their (newly recognized) equality with men? Knight responded that the relationship between man and woman is analogous to the relationship between the Father and the Son, who are equal, yet the Son is eternally subordinate to the Father in function or “role.” He based this on a unique interpretation of 1 Cor 11:3, “the head of every man is Christ, and the head of the woman is man, and the head of Christ is God” (NIV), which, he argued, establishes a hierarchy within the Trinity as well as between men and women. Thus, for Knight and the complementarian theologians who embraced this idea, the question of the relationship between men and women was inextricably linked to, indeed based on, a hierarchical understanding of the Trinity. Yet complementarians accused egalitarians of corrupting the doctrine of the Trinity in order to support their views! Giles says he knows of no egalitarians who have argued from the relations within the Trinity to an egalitarian understanding of the relationship between men and women. But by August 2016, Burk had changed his mind. He wrote, “I believe in eternal generation, a single divine will, inseparable operations, and the whole Nicene package,” noting that he did not agree with “some of [Grudem and Ware’s] particular formulations” and that “it is good and right to leave behind the language of ‘subordination’ as a label.”2 Since June 2016, the position of the Council for Biblical Manhood and Womanhood has been that belief in a hierarchically ordered Trinity is no longer central to complementarians. Apart from telling the story, Giles includes a chapter titled, “Doing Evangelical Theology,” because he is convinced that Grudem and others arrived at a wrong doctrine of the Trinity because they had “a wrong understanding of how evangelical theology is ‘done’” (67). This errant understanding limits itself largely to simply establishing what the Bible teaches, without reference to tradition or reason. In formulating the doctrine of the Trinity, tradition as expressed in the creeds and confessions of the church is especially important. The next chapter then outlines the development of the doctrine of the Trinity in the first four centuries of church history, which was considered the orthodox view until corrupted by complementarians late in the twentieth century, and now, thankfully, has been recovered by at least some complementarians. In other words, holding to the “whole complementarian package” had become an identity marker for some evangelicals, making it especially difficult for them to change their minds even if presented with good reasons to do so. If some of the world’s finest theologians could accept a heterodox view of the Trinity for so long, which of us can claim to be immune to error? Can we honestly admit the possibility that we might be wrong? 1. Denny Burk, “Why the Trinity Must Inform Our Views on Gender Roles,” A Commentary on Theology, Politics, and Culture, Aug 13, 2013 (http://dennyburk.com/why-the-trinity-must-inform-our-views-on-gender-rol...). 2. Denny Burk, “My Take-Away’s from the Trinity Debate,” A Commentary on Theology, Politics, and Culture, Aug 10, 2016 (http://dennyburk.com/my-take-aways-from-the-trinity-debate/). 3. Carl Trueman, “Motivated by Feminism? A Response to a Recent Criticism,” Mortification of Spin, June 14, 2016 (http://alliancenet.org/mos/postcards-from-palookaville/motivated-by-femi...). 4. Andrew Wilson, “Complementarianism in Crisis?,” Think, July 6, 2016 (http://thinktheology.co.uk/blog/article/complementarianism_in_crisis). 5. For further insights on resistance to changing one’s mind, see Simone Richardson, “Why It’s So Hard to Change Our Minds,” Eternity, Aug 7, 2017 (https://eternitynews.com.au/opinion/why-it-is-so-hard-to-change-our-minds/). 6. See also Scot McKnight, “Why Did it Take So Long?,” Jesus Creed, Aug 17, 2017 (http://patheos.com/blogs/jesuscreed/2017/08/17/why-did-it-take-so-long/).